There are quite a few names on this list that were on last week's list, but have now proven themselves enough to be must adds after Week 12 concludes. This week we saw a few more injuries, which is always scary not only for the player, but for fantasy owners as well. RBs Melvin Gordon, Marlon Mack, and Kenyan Drake all went down with injuries, as well as QB Andy Dalton. With the fantasy playoffs starting in a week or two, you may find yourself scrambling for some fill-ins. Let's take a look at a few players worth adding this week. Austin Ekeler is owned in a majority of leagues (probably by the Melvin Gordon owner), but he is the highest waiver wire priority this week. Gordon went down with a MCL injury and will most likely be out for a few weeks. Ekeler has always been a solid handcuff to Gordon, and showed it this past week against the Cardinals. He rushed 5 times for 35 yards and 1 touchdown, and he caught 10 passes for 68 yards. Ekeler is a must add in all leagues. Josh Adams was featured on this list last week, but he continued his strong effort by rushing 22 times for 84 yards, 1 touchdown, and 1 two-point conversion in Week 12's win over the Giants. Adams has breathed life into the previously dead Eagles' run game, and should be the lead back moving forward. He gets the Redskins at home in Week 13. Adams should be owned in all leagues at this point. Gus Edwards is another player featured on our list last week, and also continued proving himself in Week 12. Edwards rushed 23 times for 118 yards, putting him over 100 yards rushing in consecutive games. The only downside to Edwards is that he doesn't have a role in the pass game. But even so, Edwards has a soft schedule ahead, traveling to Atlanta and Kansas City before coming back home to play the Buccaneers. It wouldn't be surprising if Edwards continued his 100 yard efforts the next three weeks. Edwards is a must own at this point. I wouldn't necessarily spend any FAAB on running back LeGarrette Blount, but he could be a nice addition if RB Kerryon Johnson misses more time with a knee injury. Blount ran 19 times for 88 yards and 2 touchdowns in Week 12 (against a tough Bear defense). He also caught a pass for 15 yards. Blount is not the flashiest player, but he is a physical back who will score if he has the opportunity. This is more of a monitor over the week add. If Johnson is out, Blount has a nice volume this week against the Rams (temper expectations, Detroit will probably throw a ton) and plays the worst run defense in Week 14 (Arizona). 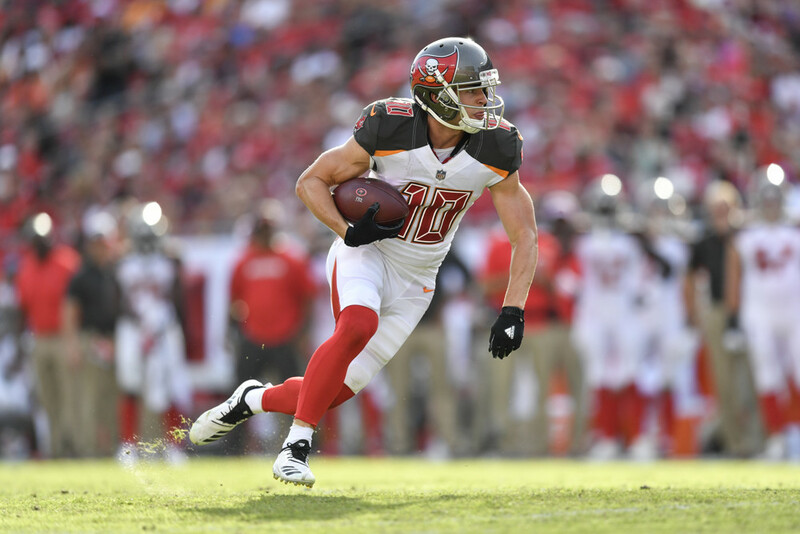 We will talk about his QB next, but WR Adam Humphries was a beneficiary of QB Jameis Winston's efficient, solid play in Week 12. Humphries caught 6 of 6 targets for 54 yards and 1 touchdown. He has now scored a touchdown in consecutive weeks with Winston under center, and looks to continue that streak in the coming weeks against Carolina and New Orleans (both at home). The Buccaneers will still have to throw a lot to make up for their bad defense, so Humphries should get consistent work. Jameis Winston had one of his best weeks so far this season in Week 12, completing 29 of 38 attempts for 312 yards and 2 touchdowns. He also rushed 7 times for 24 yards. Winston actually looked very sharp in this game, meaning he will probably get the nod again against Carolina in Week 13. Carolina's defense is not very good, so Winston should have another big game in the works. Winston, if he's on, could give you some fantasy playoff victories. The Saints' defense has been written off ever since they gave up 48 points to Tampa Bay in Week 1. But since then, quietly, the Saints' defense has been getting better every week. They have now put up double digit fantasy points in 7 out of 11 games. Last week against the Falcons, the Saints allowed only 17 points, sacked QB Matt Ryan 6 times, picked him off once, and recovered 3 fumbles. The Saints are on a tear, so this might be more of a long term defensive pickup. They have a tougher schedule ahead, but besides the Rams in Week 9, they have been pretty matchup proof.